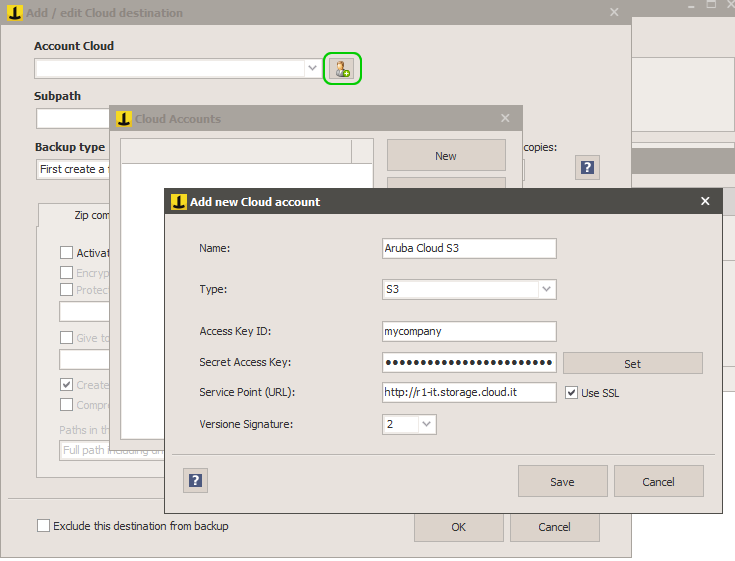 The Cloud Object Storage of Aruba Cloud is a service for online backup of files compatible with the S3 protocol. This is a secure storage for long-term archiving or for distributing and synchronizing files among different locations or different customers. Object Storage is based on the secure HTTPS protocol (but also supports FTPS) and allows you to access files from any computers, tablets or mobile devices. Like many other cloud storage services, Aruba object storage allows you to have a very simple remote backup solution on an advanced and replicated datacenter infrastructure, located in the EU. This important feature, together with the secure protocols and the AES 256 bit client-side encryption provided by Iperius, makes your backups compliant with all the latest data protection regulations, such as the GDPR. 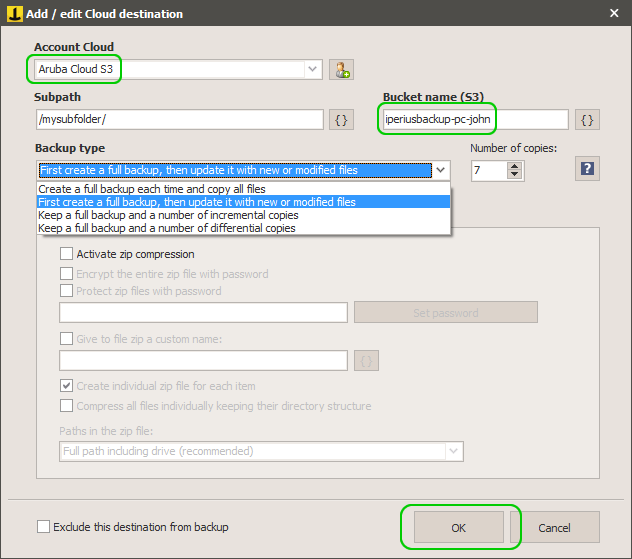 In the following tutorial, we will see with ease how to configure a backup of files and folders on the Aruba Cloud Object Storage using Iperius Backup. 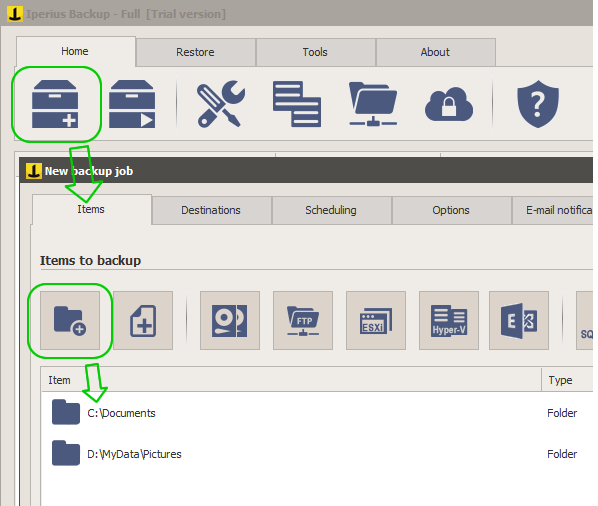 In fact, Iperius allows performing online backups to any compatible S3 storage. We can transfer not only individual files or folders to our online space but also backups of ESXi or Hyper-V virtual machines, database backups like SQL Server or MySQL, backups of Exchange mail servers – all in a completely automated and secure way. That said, we can proceed immediately with the configuration of our backup. We can add as many folders as we want, or even configure a drive image backup or advanced backups for mail clients (like Outlook), virtual machines, databases or Exchange mail servers. As you can see in the image above, you can add an account by clicking on the highlighted button. Then, in the list of accounts, hit “New”. Specify a name that can help you identify the account in the future, then select “S3″ from the Type list. 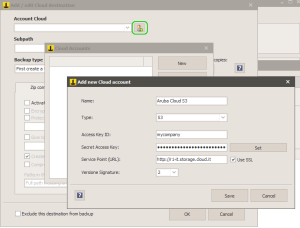 Enter the service point, the username and the password provided by Aruba. Finally, check the SSL option and set the Signature version to 2. Click “Save” to validate the account and to add it to the cloud accounts list. 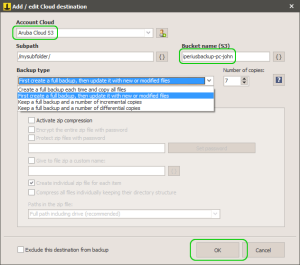 The configurations that can be made in the destination window are many, however it is important to select the correct cloud account where to upload the data (you should see the one you just created), the bucket name (which has to be globally unique), an optional subfolder, the backup type (incremental, differential, full) and the number of copies to be maintained. Finally, it is possible to decide whether to enable compression and AES 256 bit encryption. This adds an extra security level to the already secured HTTPS protocol used to transfer the files to the Aruba S3. 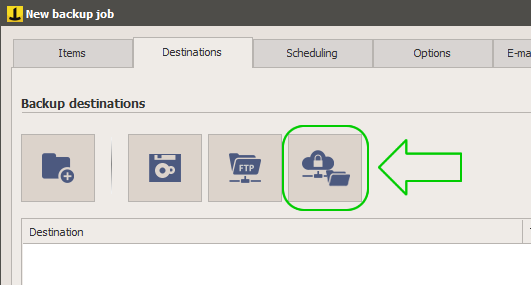 Among the other available options, let’s remember the synchronization, that is the possibility of deleting from the remote destination those files that no longer exist in the origin, being able in this way to keep a perfect mirror copy of local folders. Iperius will quickly transfer all files online, with maximum security and efficiency. Aruba Cloud Storage allows you to create a secure online space with a few simple configurations, so you can easily protect your data from ransomware viruses, thieves and environmental disasters. Iperius Backup adds extreme flexibility of configuration and a great security to this infrastructure. In fact, as we have already pointed out, Iperius performs the transfer in an absolutely secure way thanks to the HTTPS protocol and the client-side AES 256 bit encryption. Finally, Iperius has an integrated ransomware protection, that can be activated in the general preferences, and protects backups from unwanted overwriting in case the source system is compromised. 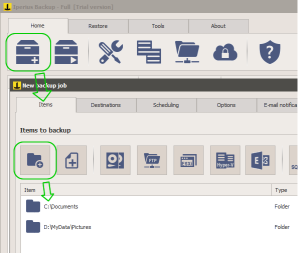 Iperius Backup is one of the most complete Cloud Backup software available. In addition to the Aruba Cloud Storage, it allows making online backups to many remote storage services, like Google Drive, OneDrive, OneDrive for Business, Dropbox, Microsoft Azure, Amazon S3, Wasabi, Profitbricks, Minio, and any other FTP, SFTP or any S3 compatible storages.